Pexip have today announced its Pexip Infinity Fusion product is certified by Microsoft as an interoperability solution for the Microsoft Skype for Business Server. Pexip’s Infinity Fusion solution enables Skype for Business meetings to be joined by non-Skype users using video conferencing technology. Pexip have worked in partnership with Microsoft for the latest version of the Infinity Fusion solution, which provides a gateway allowing Video Conferencing technologies to participate directly in Skype meetings and conferences. Fusion keeps the native user experience, removing the need for expensive training of multiple solutions, and lowers the cost of implementation and solution management. The Infinity Fusion solution has been designed for organisations of any size, but specifically with large companies and in mind, and is enables organisations to scale and provide for any number of users in an unlimited number of locations around the globe. Pexip Infinity Fusion has been certified by Microsoft for on-premises deployments of the Skype for Business Server 2015. One of the key issues found with Microsoft customers is the fact that Skype for Business cannot directly communicate via video with non-Skype for Business users. 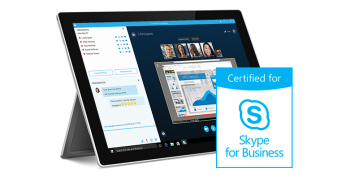 Pexip Fusion addresses this needs Skype for Business users. Beyond the core Skype for Business interoperability certification, Infinity Fusion has a variety of deployment options, including being deployed to run completely on-premises, in a cloud, for example, Microsoft Azure, or in a hybrid as a combination of the two. In addition, the solution is completely invisible to the end user, resulting in large savings on training and management. – Åsmund O. Fodstad, Pexip CEO. For more information on Pexip solutions, or to discuss Microsoft Interoperability solutions from VideoCentric, please get in touch with the team today.